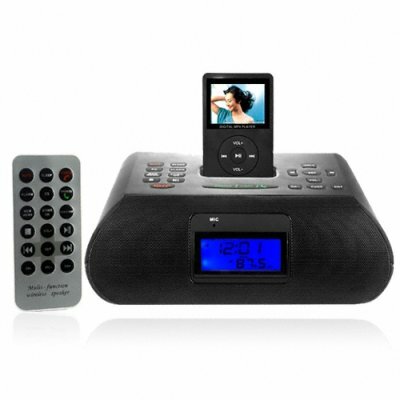 Successfully Added MP3 Clock Radio with Bluetooth - Black to your Shopping Cart. This incredible MP3 Bluetooth clock radio has just landed, and its already got everyone talking. Easy mobile phone calling via Bluetooth and the unit's microphone and speakers is now possible from anywhere you choose. The ipod connector will also charge your apple ipod overnight so it's fresh first thing in the morning and there's also an auxiliary connector if you haven't joined the apple crowd yet. A simple button layout, cool blue LCD screen and surprisingly responsive speakers (4.5W RMS)complete the package. Buy at Chinavasion's wholesale prices and put one in the office, one in the kitchen and one in the bedroom or start selling on eBay for awesome profits and take advantage of our drop shipping service. If you wish to make comments or reviews about this product, please use the product review. Please open a inquiry ticket if you have questions.